These beans are grown in the shadows of the Sierra Nevada de Santa Marta mountain range - so everything's that little bit darker. They might be washed in the mountain waters and sun dried - but it's too late. That deep flavour is already in. You don't have to sit in a room with the curtains drawn to enjoy it, but dang, why not? Might just be the best way to experience how the gentle tang of red fruits cuts though the hazelnut and caramel. Here is a Mule who wants to look on the bright side of things. He does. He's tried really hard to be that little ray of sunshine, to be fine with it all. But he's not really that type. The mere sight of Robusta beans or instant coffee crumples his brow and clenches his jaw. After all, good coffee is never a matter of taking it easy - flavour doesn't just 'turn up'. It needs to be cultivated by expert growers, coaxed by obsessive roasters, and given the 'Hooves up' by the fussiest critic there is. Store away from direct sunlight and any strong odours - these beans have had enough sun thank you very much. And don't even think about putting it in the fridge., Once open, squeeze out the air, seal the bag tightly and use within 2 weeks. 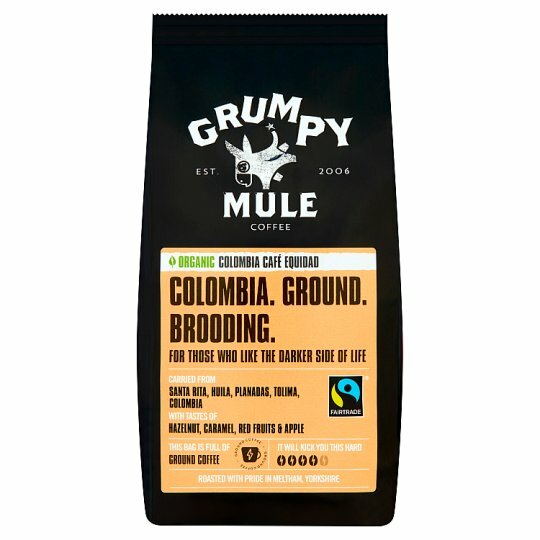 Grumpy Mule coffees are suitable for use in a wide range of brewing equipment. For espresso machines, finely grind your beans for best results. Use 2 heaped dessertspoonfuls (those big ones your mum only had out for special occasions) of fresh, ground coffee per cup. If you want to be a nerd about it that's 15g per 250ml of coffee. Espresso-heads, a good extraction time for our coffee is about 27 seconds per shot. Just don't count mississipily (watch Friends, it'll make sense). Allow heated water to come off the boil (about 93-95º) before pouring. It's just enough time to tweet a pic of the pack at a jaunty angle. Serve the coffee immediately once brewed.